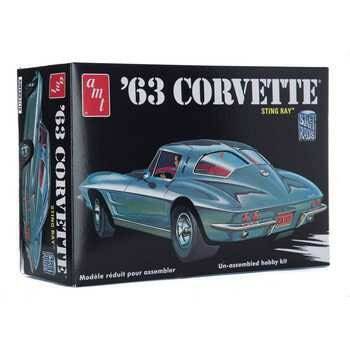 AMT presents this 11963 Chevrolet Corvette Sting Ray Model Kit as a Retro Deluxe reissue, recreating the 1970’s Street Rods Series release. This 3-in-1 kit features parts to build factory stock, street custom or drag gasser versions. With pre-lettered drag slicks and an all-new retro-styled full color decal sheet, the kit is improved greatly over past releases and the vintage box art is sure to please!